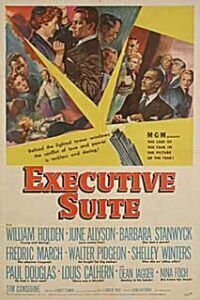 Executive Suite is a 1954 motion picture about the succession struggle and associated intrigues involving a fictitious Fortune 500 corporation and its leading personnel after its president suddenly dies. Avery Bullard, President of Tredway Corporation, bids farewell to his investment banker in New York City, sends a telegram to his headquarters in Millburgh, Pennsylvania calling a meeting of his executive committee, steps out onto Wall Street to hail a taxi—and then suffers a stroke and dies. From the investment banker's office, one of Tredway's directors witnesses the death and orders a massive short sale of the company's stock. In Millburgh, when the story breaks, five Vice Presidents—each of whom has his own particular ambitions and struggles—begin vying for the succession. To make matters worse, the remaining member of the board of directors—Julia O. Tredway, daughter of the late founder and companion to the now-deceased Mr. Bullard—contemplates a full liquidation of her company stake. Raoul Freeman as Avery Bullard, President, Tredway Corporation, Millburgh, PA. The few scenes that include Mr. Bullard are all shot from his POV, up to the moment of his death. Nina Foch as Miss Erica Martin, his secretary. William Holden as McDonald "Don" Walling, Vice-President in Charge of Design and Development, Tredway Corporation. June Allyson as Mary Blemond Walling, his wife. Tim Considine as Mike Walling, his son. Walter Pidgeon as Frederick Y. Alderson, Vice-President and Treasurer, Tredway Corporation. Virginia Brissac as Edith Alderson, his wife. Fredric March as Loren Phineas Shaw, Vice-President and Controller, Tredway Corporation. Paul Douglas as Josiah Walter Dudley, Vice-President for Sales, Tredway Corporation. Shelley Winters as Eva Bardeman, his secretary and companion. Dean Jagger as Jesse O. Grimm, Vice-President for Manufacturing, Tredway Corporation. Mary Adams as Sara Asenath Grimm, his wife. Edgar Stehli as Julius Steigel, his boss. Lucille Knoch as George Caswell's wife. Chet Huntley providing introductory voice-over narration. Avery Bullard's motivations remain a mystery, as does the secret of his actual preference of a successor, a preference that he takes with him to his grave. Don Walling came to Tredway as Bullard's chief designer—but lately Bullard has grown distant from him and has not supported him as promised against the penny-pinching policies of Loren Shaw, the company controller. Bullard's death leaves open the questions of succession, the company's future, and Don's own future with Tredway. Julia Tredway's father committed suicide during the Depression when Tredway faced bankruptcy. Avery Bullard stepped in, saved the company, romanced Julia—and then ignored her. Now that he's dead, Julia has lost interest in the company and even contemplates following her father out of his old office window. Fred Alderson has stayed close to Bullard for fifteen years, but only lately realizes that Bullard did not prefer him for the presidency. With Bullard dead, Alderson, a nearly broken man, scrambles to find a successor whom he can support—any successor but Shaw. Loren P. Shaw, CPA (a certification he earned in night school), came to Tredway with the aid of George Caswell. He has worked himself up mostly by intrigue and personal spying. He knows everyone's secrets and weaknesses, and can play people as though they were musical instruments—except for Don Walling, whom he regards as no threat because he is "too young" for that. J. Walter Dudley has a wife who is bored with waiting at home, and seeks solace in the arms of his secretary. More than that, he has never fought a real battle in his life. This makes him more vulnerable to a gossip-spy like Shaw than anyone else at Tredway. Jesse O. Grimm built the company's manufacturing base, and resents young "slide-rule experts" like Don Walling. Neither has he much use for Shaw—but he wants nothing more than to retire, and has lost interest in the company that had been his love. George Caswell is a high-liver always looking for "easy money." He makes an "insider trade" the like of which would get a man arrested today, and even in the era in which this story took place, the Securities and Exchange Commission would take a dim view of his activities—a fact Shaw knows and keeps track of. Caswell crassly plays on his voting power to extort from Shaw a promise to sell him some company stock cheap so that he can cover a short sale that would otherwise spell disaster for him. Ambition is a fairly common theme in all movies. Executive Suite features almost as many forms of ambition as it has leading actors. These forms include the simple ambition to make money (even "easy" money), the ambition for a promotion (or the succession to a headship), and the ambition to accomplish something positive. Different kinds of ambition drive men (and women) to do different things to realize those ambitions, as this film illustrates very well. As Avery Bullard's last message reaches the Tredway Tower and Erica Martin delivers it throughout the complex of offices known as Executive Suite, the news finds each of the five Vice Presidents in the middle of separate situations or pursuits. Exactly what each Vice President is doing when he gets the message is quite telling. Another thing this film illustrates well is the consequences of hero worship. Avery Bullard is a hero, as the back-story shows: he saved the company from almost certain bankruptcy and dissolution after its founder committed suicide. In death he becomes an idol to many of the associates he leaves behind. Some of those people—Don Walling, for example—must overcome their idol worship and reassess what Avery Bullard actually meant to them, if they expect to achieve their goals. That reassessment will include the realization that even their hero made mistakes—and those mistakes did not limit themselves to his expressed or implied preferences for a successor. More than one reviewer has taken note that Don Walling is the only executive not campaigning actively for the presidency, and also the only executive who honestly has the best interests of his company and community at heart. Thus Don Walling represents a common type of the Golden Age of Hollywood: the reluctant hero/leader. In the end, he pursues a campaign for the presidency only because, in the hands of any other successor (but more particularly in the hands of the stingy Shaw or the cowardly Dudley), the company might crash and take the town with it, a thing that he cannot allow to happen. This film was based on the 1952 novel of the same title by author Cameron Hawley. Perhaps in the certain knowledge that a novel with such a multiplicity of characters would prove difficult to follow, Metro-Goldwyn-Mayer Studios opted for an all-star cast. The cast list for this film includes at least ten of the most famous and highly-paid stars of the MGM stable, many of whom had already been leading men and women in many other films. The director was Robert Wise, another Hollywood veteran. This film was released in the United States on April 30, 1954, and worldwide shortly thereafter. It appeared in French-speaking and Spanish-speaking parts of the world under titles that translated as "The Tower of the Ambitious Ones." Nina Foch received a nomination for an Academy Award for Best Performance by an Actress in a Supporting Role for her excellent portrait of the leading secretary, Erica Martin. She won the award in that category given by the National Board of Review. In an interview that she gave to film historian Robert Osborne, Miss Foch said that she had resented the peremptory order she had received to appear in this film in such a "small" role. She responded by making her role into one that was anything but small. Afterward, she realized that she had been tricked into delivering exactly the sort of performance that Robert Wise wanted. Her National Board win and Academy Award nomination shows that at least some of her colleagues understood and appreciated what she did.